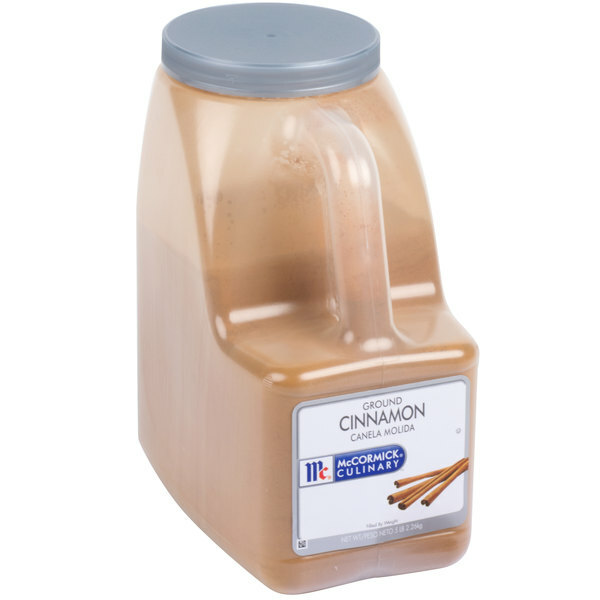 McCormick Ground Cinnamon - 5 lb. An essential spice for any kitchen, McCormick ground cinnamon adds an earthy, familiar flavor to baked goods, curries, dessert sauces, apple sauce, and beverages! Reddish brown in color, this woody, earthy flavor is warming to taste. The finer the grind, the more quickly cinnamon is perceived by the taste buds. One of the oldest known spices, cinnamon is derived from the dried inner bark of a tropical cassia tree. For a fragrant pilaf, cook rice in cinnamon flavored broth and stir in chopped dried fruit and toasted nuts. The sweet-spicy flavor of cinnamon enhances the taste of vegetables and fruits, while mellowing the tartness of fruity baked goods like apple pies. Cinnamon also pairs perfectly with chocolate; use it in any chocolate dessert or drink. However, ground cinnamon should not be added to boiling liquids, as the liquid may become stringy and the cinnamon will lose flavor. Overall User Rating: McCormick Ground Cinnamon - 5 lb. The McCormick Ground cinnamon is delicious and a great quality spice company. We use cinnamon in almost every one of our baked items and its great. A nice bulk container of McCormick ground cinnamon. Love the quality of McCormick spices. Their cinnamon is truly perfect and makes great tasting baked cookies. A nice bulk buy of McCormick ground cinnamon. McCormick is a great quality brand their cinnamon is the best one for baking. The cinnamon never disappoints. 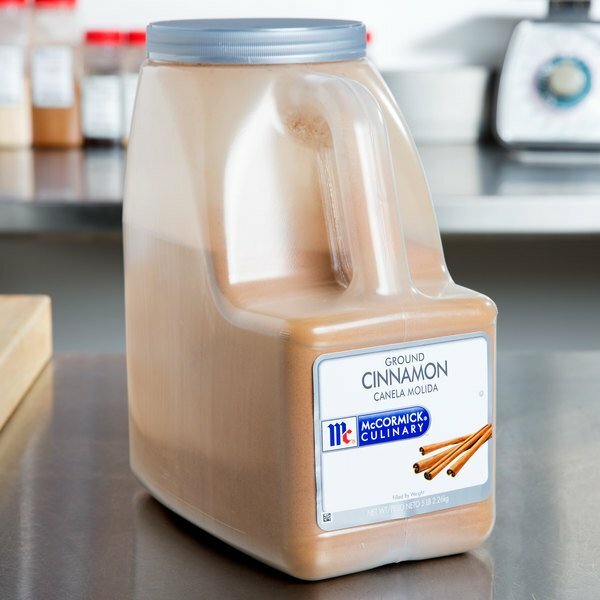 We love Mccormick cinnamon and so glad to be able to get the huge sizes from an online source. Price is less than any local suppliers. A great quality ground cinnamon that is perfect for our bakery. The cinnamon is sweet and perfect for making our snickerdoodle cookies. The bulk container was a great buy. You can't go wrong with McCormick and i love this large size of the ground cinnamon. i use it so often and it stays fresh for so long. Mccormicks cinnamon, like their other spices is of great quality. You know that it's going to be fresh the second you open it and give such good flavor to your food. The McCormick brand is iconic and very much so do to their great quality. Their ground cinnamon is perfect for making cookies and the cinnamon is such a good quality. I love using mccormicks ground cinnamon. It tastes awesome and I use it in a variety of dishes. I love using it during the fall when I bake with more spices. Fantastic cinnamon with a mild but sweet flavor and light silvery brown color which means it's fresh and tasty! cinnamon is also fantastic for helping sugar to not spike in the blood and to fight of sickness and help against arthritus and joint problems. We're using this with dried apples to make a sort of gluten free sugar free elephant ear!